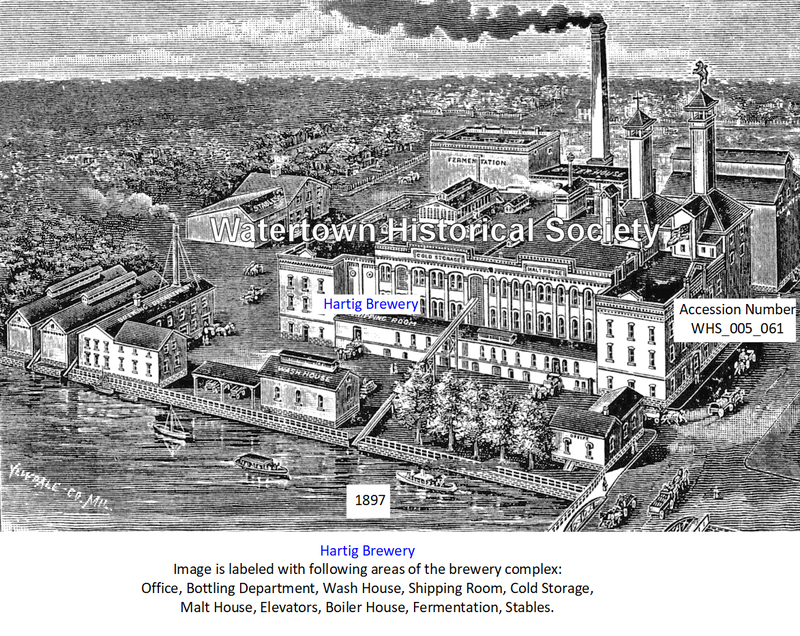 Malt House, Elevators, Boiler House, Fermentation, Stables. 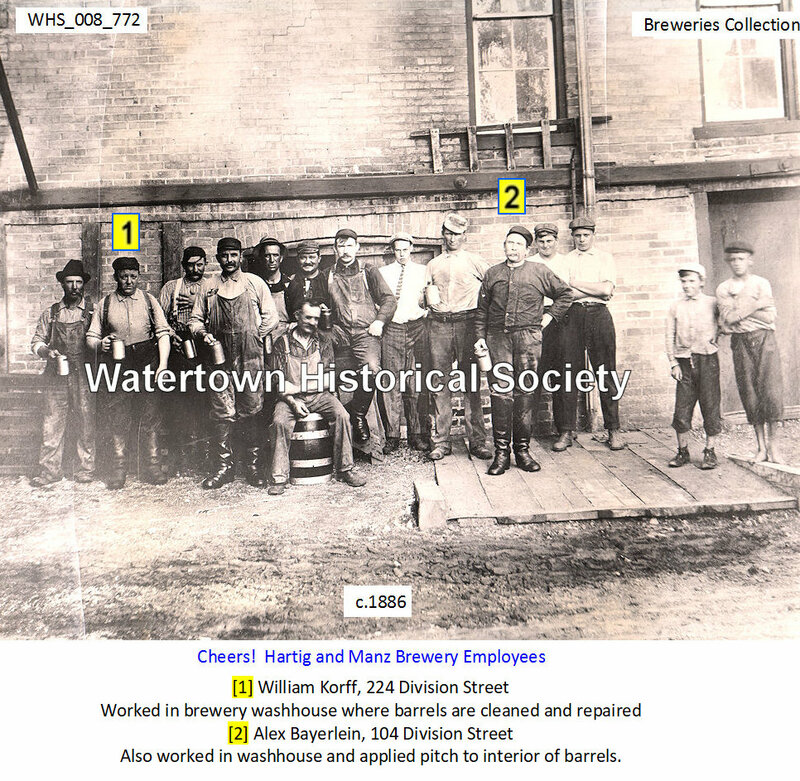 The brewery was started in 1884 by cousins William Hartig and Carl Manz, both of Milwaukee. 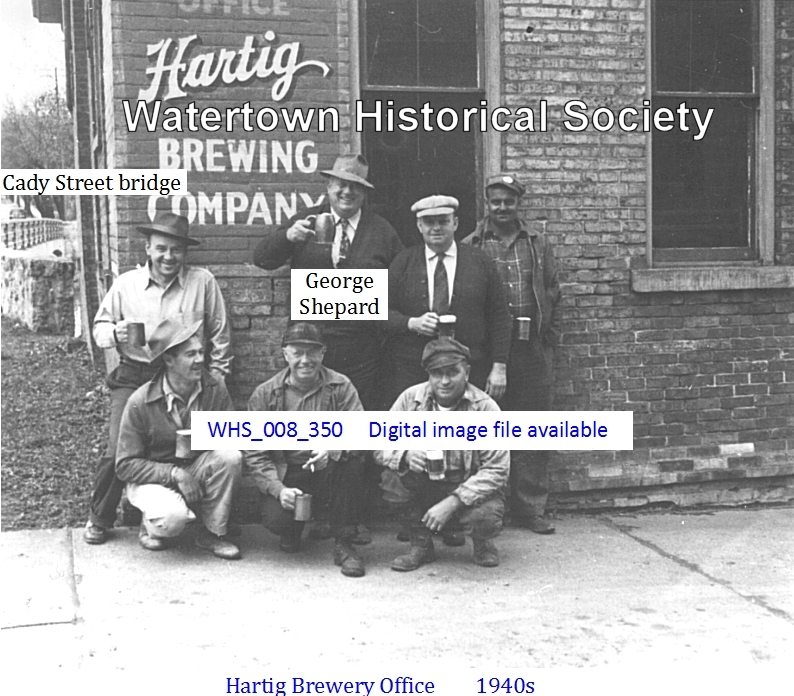 William Hartig had come from Slinger where he had been in the brewery business with Charles Storck. Charles or Carl (Karl) Manz was the nephew of the late August Krug, founder of the Schlitz Brewery in Milwaukee. Charles was the son of Anna Krug, August's sister, and may have been a beneficiary to his late Uncle Krug's estate. 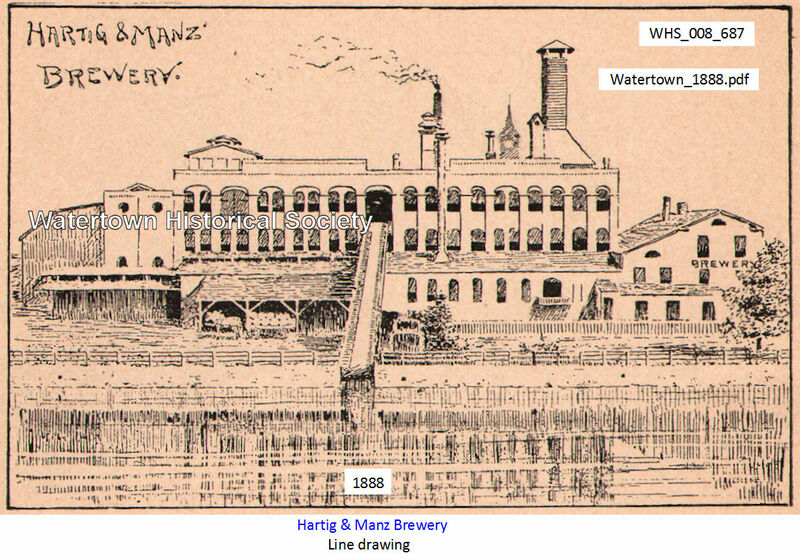 In 1896 Hartig bought out Manz and the brewery became known as the William Hartig Brewery and operated until Prohibition. 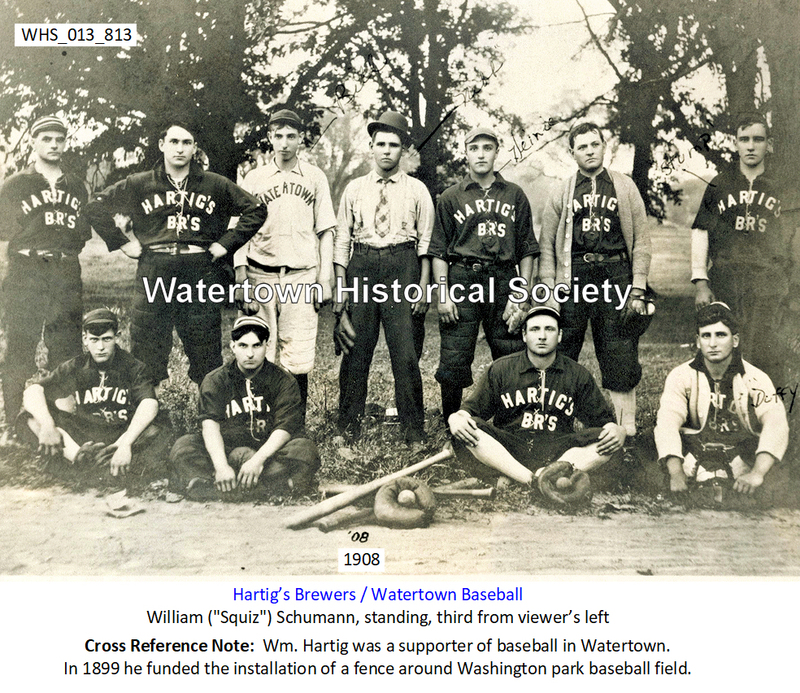 William Hartig died in 1923 and is buried in Oak Hill Cemetery in Watertown. 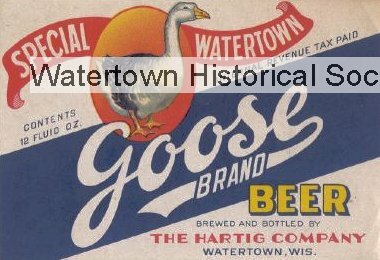 His family re-opened the brewery in 1933 and ran it with modest success until the early 1940s when they sold it to out of town investors. The quality began to suffer and it shut down in 1946 and declared bankruptcy in 1947. The buildings were torn down in 1953 and a supermarket was built on the site in 1954. The residence of William Hartig, of the firm of Hartig & Manz, in the Fourth ward, is one of the handsomest and best finished dwellings erected here during the present season. Ice house behind the Hartig Brewery. Later the Habhegger Cold Storage plant. Is one of the most complete and the quality of Beer that is turned out cannot be excelled. The plant covers an area of 80 x 300 feet and is complete in every detail. The annual product is about 20,000 barrels of Beer and 200,000 bushels of Malt. Bottled Beer for Family Use. William Hartig is having placed in his brewery an ice machine, or in other words, a new process for cooling beer. Lager beer, to be kept in prime condition, should have an even temperature, and this is almost impossible to secure under the old system. This comparatively new process gives the desired result regardless of the extremes of weather. The new outfit consists of a Corliss engine and ammonia compressor, and between 5,000 and 6,000 feet of piping. This piping is carried all through the cellars, overhanging the large beer cask, and is continually covered by a uniform coating of ice. The expense of the new outfit will exceed $5,000. 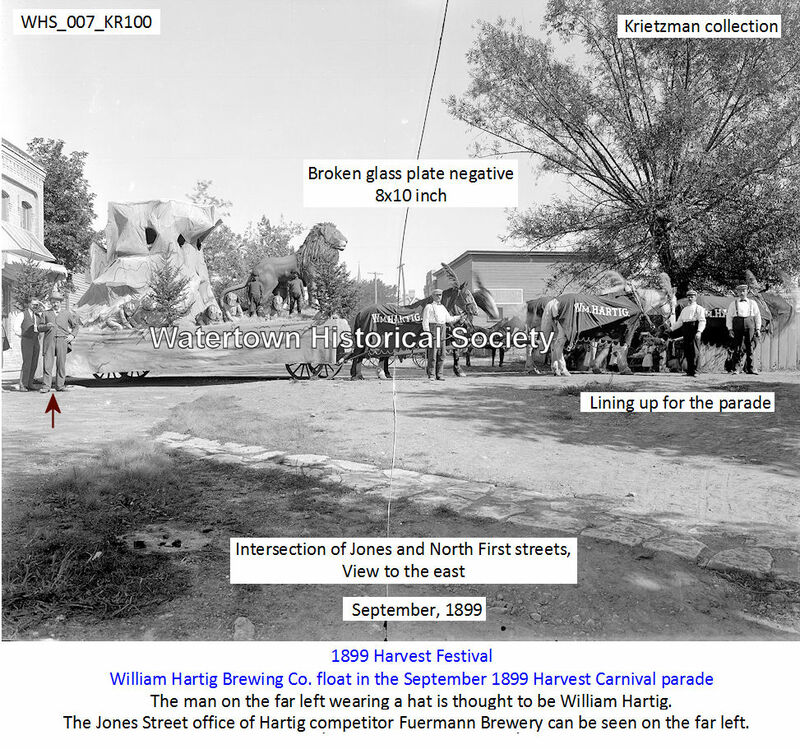 William Hartig Brewing Co. float as entered in the Harvest Carnival, Sept. 1899. 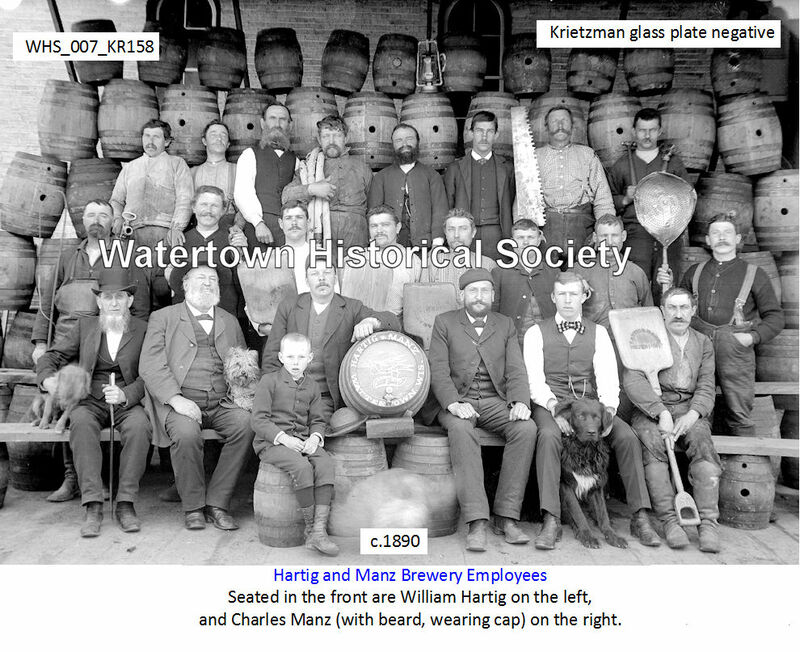 The man on the far left wearing a hat is thought to be William Hartig. This image was taken at the intersection of Jones and North First Streets. 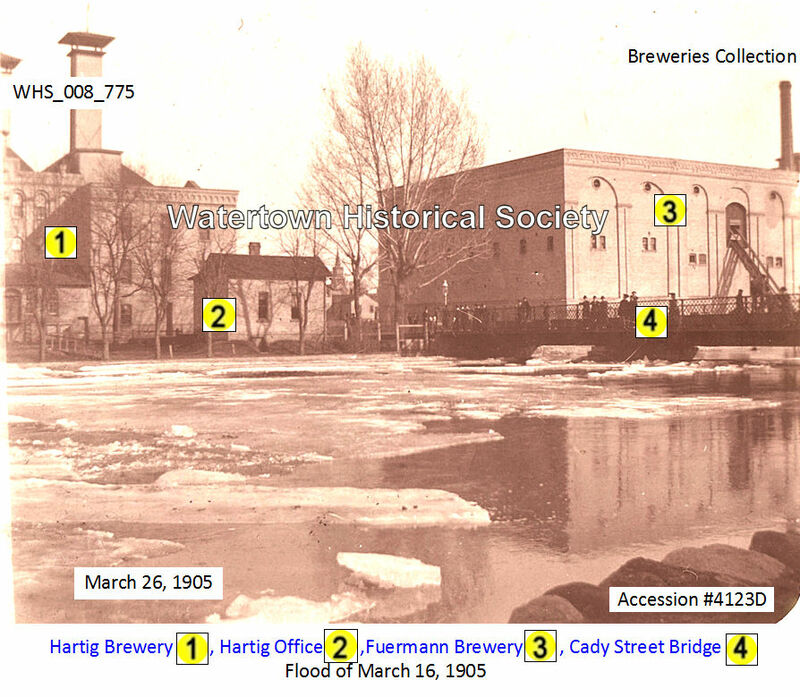 The Fuermann Brewery office can be seen on the far left. 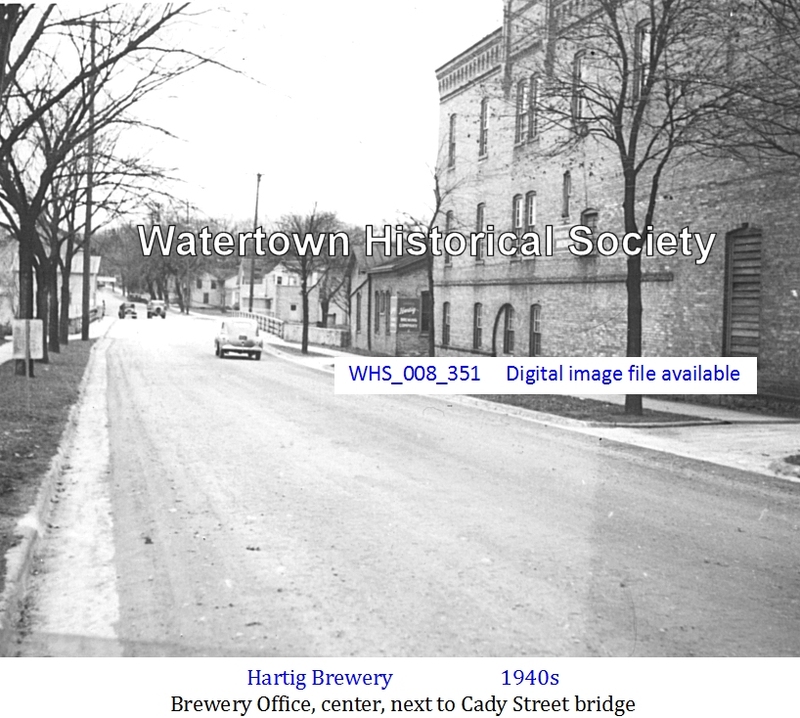 Watertown s first attempt in the carnival line last week was a great success, a success as regards attendance, entertainment and a good time for the thousands of visitors. The weather was delightful throughout, and a larger or better-pleased crowd was never attracted to any interior city of the state, and the visitors were provided for in a manner that speaks well for our citizens. One pleasant feature of the carnival was that it was not necessary to make a single arrest for unruly conduct, and the immense crowds of people behaved themselves admirably well . . . The float of Wm. 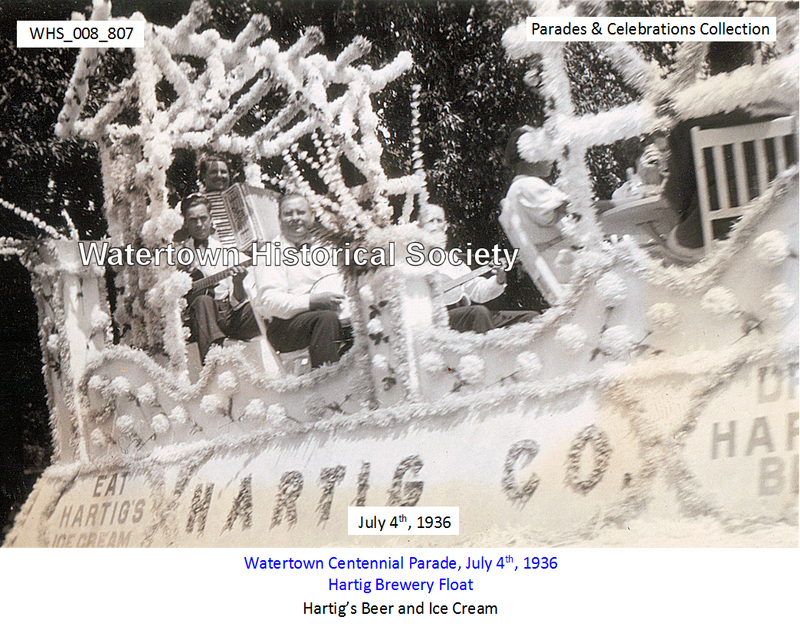 Hartig Brewing Co. in the latter part of the parade took fire as it reached Main Street from red fire sticks carried by attendants. The alarm of fire was sounded, the float was drawn to First Street when the department put the fire out. This was the only accident during the entire carnival. During the noon hour last Monday a fire in an outhouse in the rear of Herman Dobbratz’s brought out the fire department. It was promptly extinguished. Edward Rimestead, while trying to board the hook and ladder truck at the corner of Main and First streets, fell and narrowly escaped death, being flung against the wheel of the truck with terrific force. He was taken to Dr. Werner’s office and medical attention given him at once. He was badly shaken up and bruised, and his injuries will lay him up for several days. He is employed as a teamster by Wm. Hartig. It is said that the inhabitants of the United States are a beer drinking people. Be that as it may, the fact cannot be denied that the manufacture of beer is one of the great industries of the country and the source of a vast amount of revenue to the government. In the front ranks of this great industry is the state of Wisconsin with its countless lines of manufactories. The citizens of Watertown who relish the amber fluid need not go out of their own city to secure a brand of the highest quality. 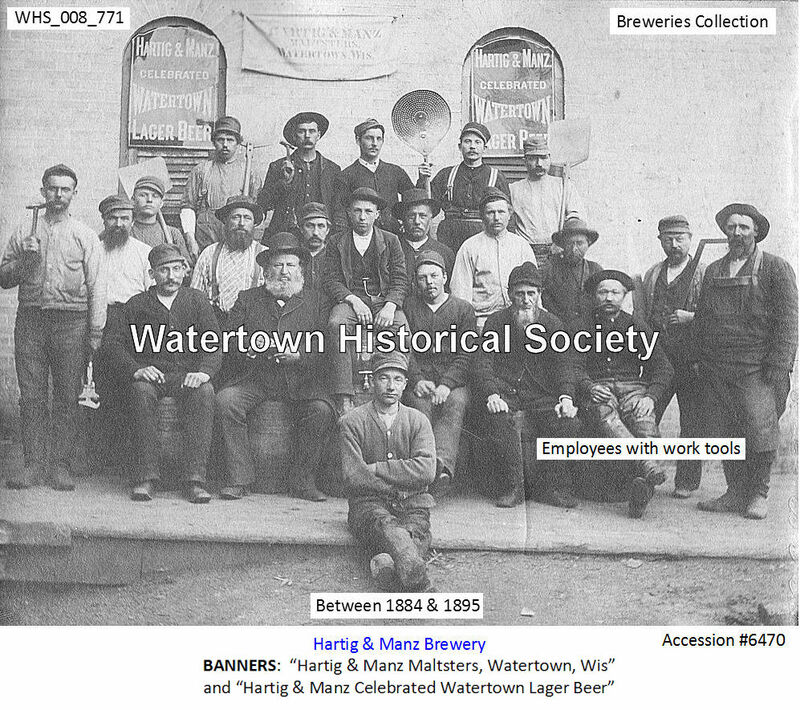 Occupying a leading position among our prosperous industries is the old established brewery owned and operated by Wm. Hartig. Undoubtedly a large number of our own citizens fail to realize the importance and magnitude of this industry in their midst and the important part it plays in the prosperity of the community. This establishment has been conducted under the management of Mr. Hartig for the past 19 years, with a constant increase in trade. The manufacture of the cooling beverage is now conducted in a brick building 90 by 300 feet, three stories in height. In addition, there is a neat brick office where the gentlemanly manager, Mr. Tanck, waits on the numerous customers. A large malt house, where thousands of pounds are stored, occupies an extensive space. Much of the malt in this building is consumed at home and a vast amount also shipped out of the city. North of the office is a commodious wash house where the emptys are cleaned on their return to the plant. Two blocks north of the main building is another large structure used as the bottling house, where the different brands of bottled beer are put up in the cases. On making so much of a survey, the reporter could not resist the temptation to inspect the interior of the brewery proper and learn somewhat of the process gone through with in the manufacture of this popular beverage. Consequently Mr. Hartig, Jr., was hunted up and the enjoyable tour of inspection commenced through the building, the courteous guide making brief explanations as each point of interest was reached. This particular journey was commenced in the engine room where the large boilers and 30 horse power engine furnish the energy which drives the machinery throughout the plant. From the engine room the way led into the room where the ice machines, propelled by a 50 horse power engine, supply the artificial frost to the large storage rooms above. A number of rooms were gone through, which will be described in their order in regard to the brewing process. The barley is taken to a number of mammoth bins holding from 500 to 4000 bushels. This place is known as the elevator tower. In starting on its journey the barley first goes through the oat cleaning and barley separator. Later it is spread in six large vaults in the basement where the sprouting process takes place. Following this is an intricate series of processes and machinery to travel through. The grinding machine, masher, malt cleaner and polisher, pneumatic drums for malting purposes, the air from which is drawn up by large fans, the steeping vat, a large copper kettle of 80 barrels capacity, then to the hop barrel, whence it issues a pure malt and hop product. This is followed by numerous processes of fermenting and cooling — all done in large vats in cold rooms—running through the filter which is supplied with coke from a large tower. Then comes the trip cellar, after which it is carried up to the top where the ice machines keep the air near the freezing point. In the top story are also located the enormous storing vats. From the cooling it comes back to the racking room where it is either placed in kegs and barrels or put through the final process for bottling at the works two blocks north. In the upper story are two tiers of drying rooms where the malt is dried and downstairs several vaults where the barley is dried after sprouting. 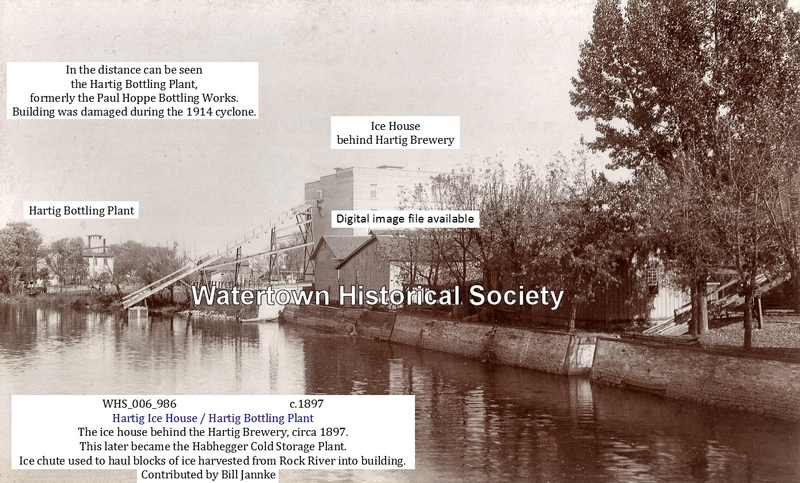 This is by no means a description of the process of beer making but simply the swiftly passing picture as presented to a visitor making a rapid survey of the plant. The brewery is supplied with a dynamo which furnishes the electric lights. Thirty men are employed by this establishment throughout the year. The capacity is 16,000 barrels and the consumption of barley about 200,000 bushels. 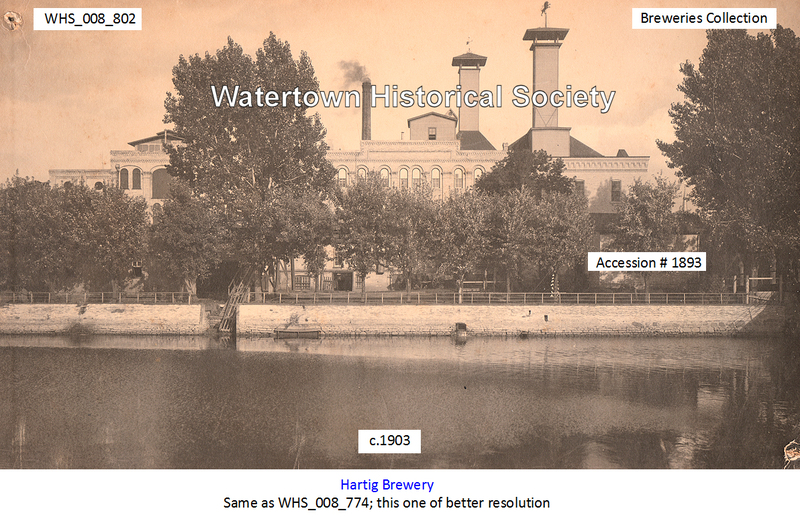 William Hartig, the enterprising and progressive brewer, has equipped his institution with a large new boiler, reshingled his barn and removed the old ice house north of the brewery and cleaned things up generally and is making everything about the establishment as neat as a new pin. 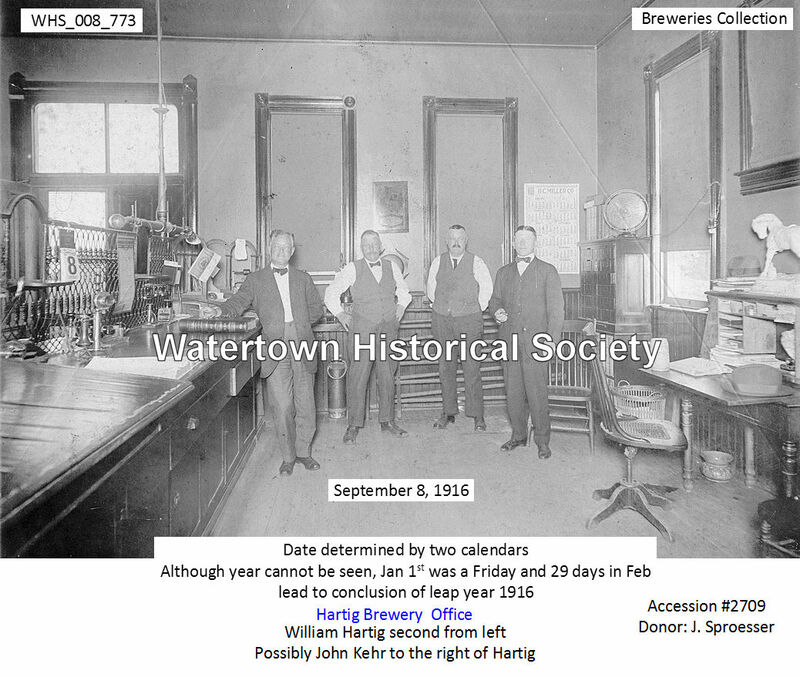 John Kehr, office manager for the Hartig Brewery, and the late Anton von Heiden made an election bet. Von Heiden lost and as a result had to give Mr. Kehr a ride in a wheelbarrow along Main Street. Hundreds turned out to cheer. 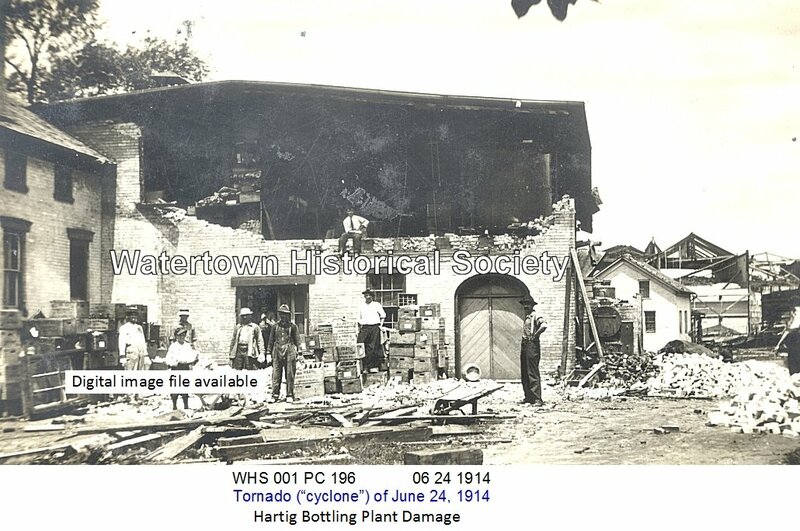 1923 WILLIAM HARTIG DIED, buried in Oak Hill cemetery. Donated to the city in 1930 by Mrs. Carry Mowder Hill in memory of the Mowder and Hill families and installed in Memorial Park. 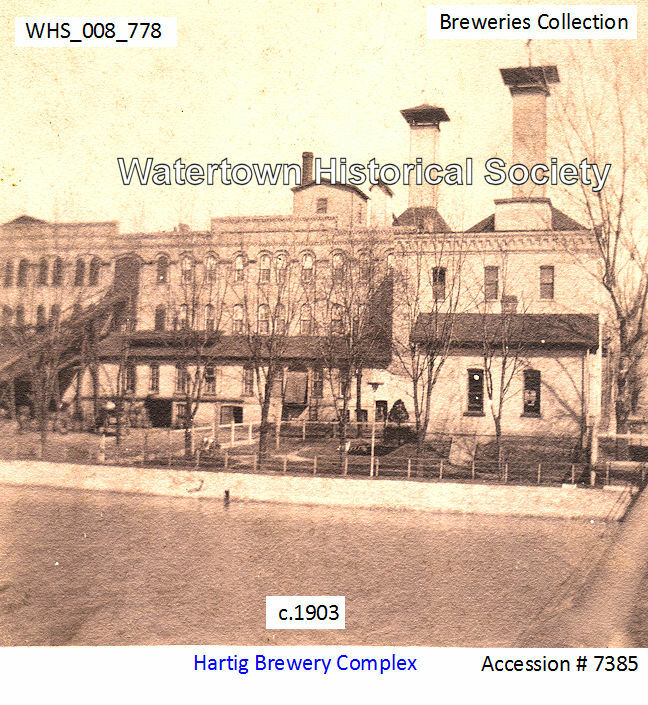 View is to the north and the building in the background was the tasting room of the Hartig brewery. 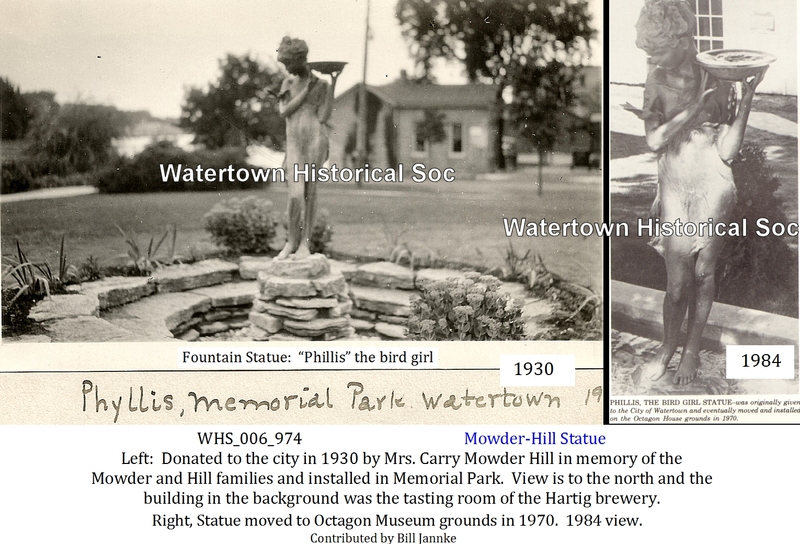 Statue moved to Octagon Museum grounds in 1970. 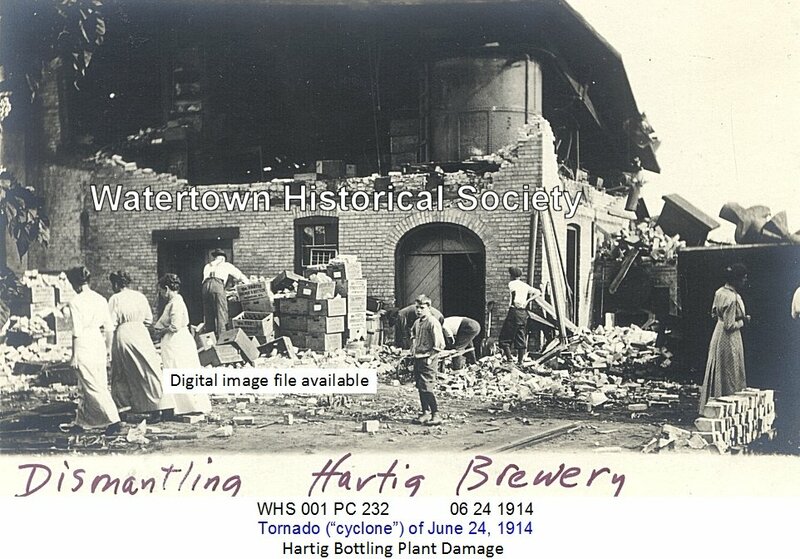 Bottle beer will be available at the Hartig company in about another month. Facilities to bottle the beer are now being added. The section in which cars and trucks now are housed is to be remodeled and equipped with bottling machinery. A new seven car garage is nearing completion, to replace the present garage, which is more adaptable to house the bottling equipment than a new unit would be. Edward F. Kaercher, 85. Was born Jan. 16, 1866, a son of Mr. and Mrs. John Kaercher and lived all of his life in Watertown. He had worked at the Hartig Co. plant for 40 years, retiring at the age of 77. An object which many older residents of Watertown will view as a sentimental relic of a happier era was taken from Rock River here the other day by Bruce Kaesermann, aged 11, son of Mr. and Mrs. Ronald Kaesermann, No. 10 Pawnee Street. He found it while playing in the area of Schaller Park. 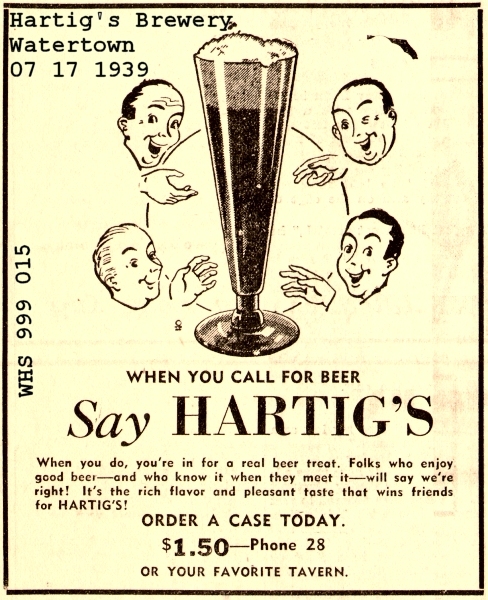 It turned out to be a beer keg from the period of the Hartig Brewing Co. which produced some of the best and most palatable beer every brewed in Wisconsin or almost anywhere else for that matter. 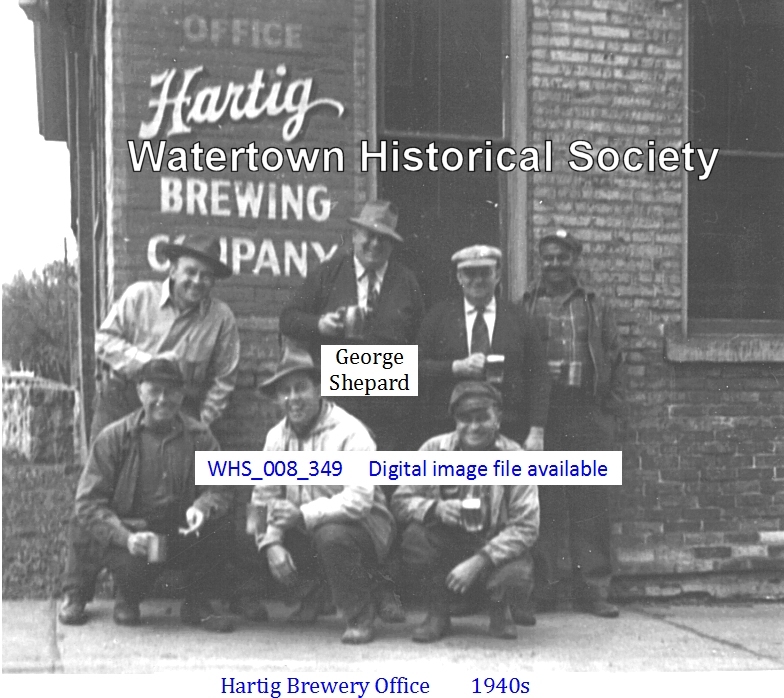 The keg still has on it a brass plate bearing the name of the Hartig Brewing Co. whose plant was located in the block which now houses the National Food Store in Cady Street, opposite the old Memorial Park which somehow got turned into a site for Watertown’s present municipal building. 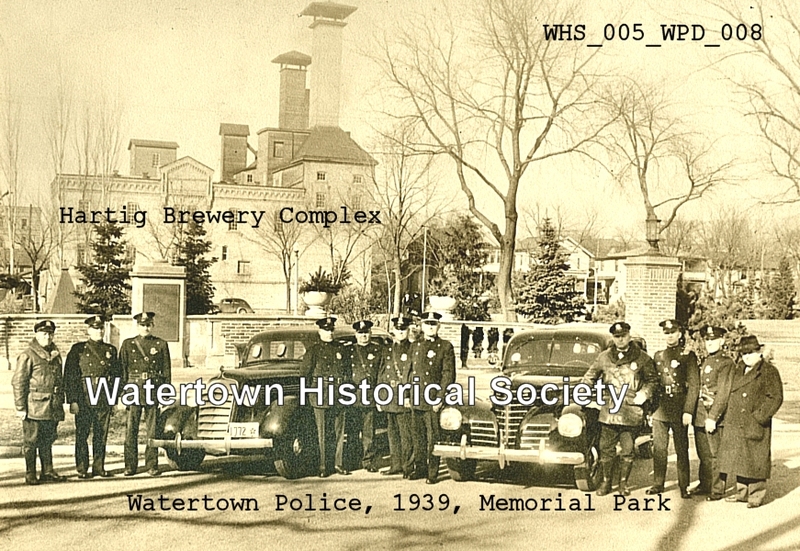 The brewery was the largest single building in Watertown. 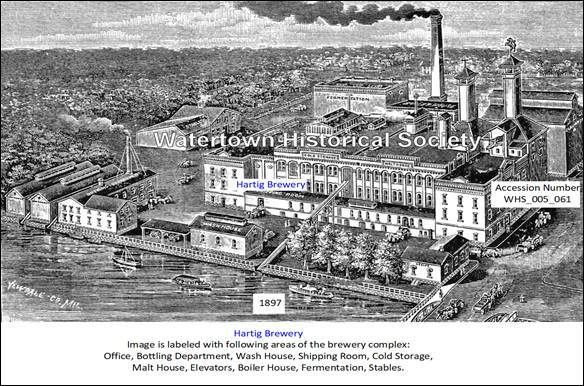 It was but one of several breweries here, but it was the last to survive, having gone through the Prohibition era when it converted to making “near beer” and ice cream. When Prohibition ended it converted back to making beer. 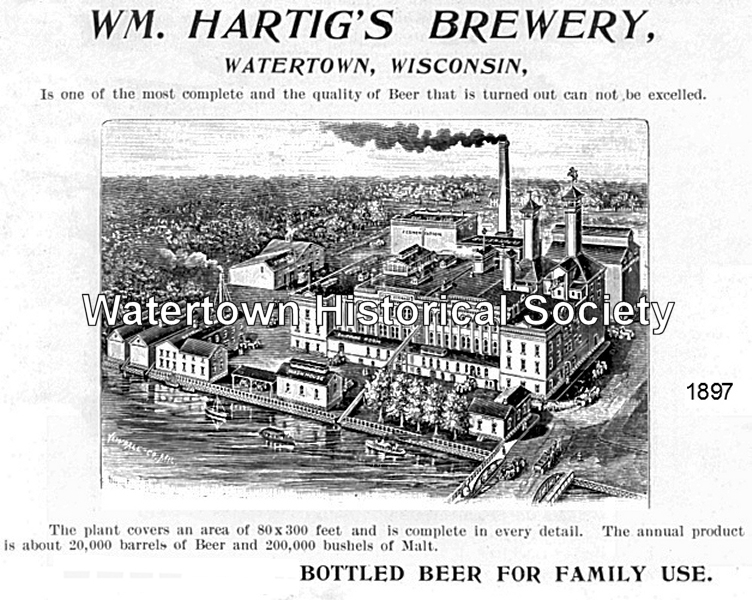 Along, with most smaller breweries in the state, it finally faded from the scene, leaving the field to the major breweries and monopolies which now turn out beer that does not even approach the fine brew which Hartig’s and other smaller breweries produced years and years ago. Philip Hartig, obit, president of Hartig Co after father’s (William) death and up until business was sold to outside interests in 1947.